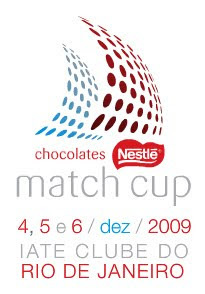 I am in Rio for the 7th annual Nestle Brasil Match Cup 2009 today through Sunday. It is pretty local but that is not to say it is not competitive. Amongst the competitors is Torben Grael, five time Olympic medalist and Star World Champion as well as, Robert Scheidt four time Olympic Medalist and Star World Champion and Xavier Rohart from France who is a two time Star World Champion and Bronze medalist from 2004. There are a many good local young sailors keen to beat one of the guys with all these titles. After a press conference this morning, the teams went out for about 2 hours of training in the boats. At 1500 the flights started. There is a small fleet race component to this event and that is what they started with for the first four competitors. There are 4 boats, but 8 competitors so we don't all race all the time. 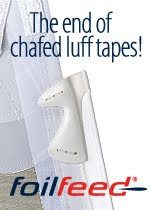 Unfortunately for us, we didn't get to race today as our first race is in the fourth flight and the race committee only got 2 flights in before the wind died. There is a womens division in the regatta and they sail in J-24's, while the men race in Bennetau First 40.7's. My crew is a bunch of Star sailing friends and two young Brazilian kids. Ross MacDonald and his wife Marcia (a former 470 and Europe dinghy Olympian for Brazil), Flavio Marazzi and his crew Enrico de Maria (who finished 4th in Athens in 04). Then we have the two kids, Lucas Brun (son of Gastoa and nephew of Vince) who was part of the ABN Amro youth team in the 2006 Volvo Ocean Race and Thomas Low-Beer who is an up and coming 470 sailor for Brazil in 2012 and an engineering student here in Rio. I started out my day today at 0600 with a run down Ipanema Beach. I found the most beautiful gym in the world. It is outdoor and on the beach. I am going tomorrow and will take pictures. Now I am off to my friend Alan Adler's house for a Bar-B-Q. Alan is another Star World Champ. There are 6 of us down here in this regatta! Alan is the promoter of this event and has another event this weekend in Sao Paolo with Maria Sharapova.